Go here for a French translation of this page courtesy of Kate Bondareva; a Ukrainian translation courtesy of Anna Matesh; a Hungarian translation courtesy of Elana Pavlet; a Macedonian translation courtesy of Katerina Nestiv; an Indonesian translation courtesy of Jordan Silaen; a Romanian translation courtesy of Irina Vasilescu; a Chinese translation courtesy of Lynly Loh; a Hindi translation courtesy of Nikol Barton; a Croatian translation courtesy of Milica Novak; an Estonian translation courtesy of Martin Aus; or a Punjabi translation courtesy of Fateh Singh and Shamsher Singh; or a Russian translation courtesy of Melissa Cartew; or a Vietnamese translation courtesy of Alivia Cora; or a Czech translation by Alan Alaxander; or a German translation by Maxwell Edward. Writing is a fairly recent invention, but powerful in improving human intelligence. The first writing was logographic, where a symbol represented the meaning of a word. This meant a vast number of symbols to learn. In a later system, symbols representing syllables were introduced, a shift to sound-based writing. With the development of the alphabet, writing used an economical group of symbols representing speech phonemes, the vocal gestures from which words are constructed in a language. However, using an alphabet requires sufficient familiarity with phonemes to recognize them in spoken words, and this can be a serious hurdle. Phonemes are produced very rapidly in ordinary speech (10-20 per second), and the vocal gestures overlap, making phoneme boundaries difficult to discern. This diagram illustrates how alphabetic writing works. 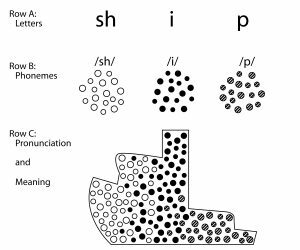 The spelling SHIP maps out the pronunciation of ship. The alphabetic code allows a systematic way to read any word by following its pronunciation map. To sound out a word, you translate the letters into phonemes, blend the phonemes to approximate the pronunciation, and recognize the word. Phonics is simply decoding instruction–teaching beginners to understand spellings as phoneme maps. However, because phonemes are coarticulated, phoneme awareness must usually be taught explicitly, not just assumed. We’re used to thinking of two routes to word recognition: sight and decoding. However, all skilled readers acquire sight words, and all are expert decoders. Moreover, we can recognize words by analogizing, stringing together pronounceable word parts, or contextual guessing. Sight recognition means instant recognition without analysis. Decoding involves translation; although early decoding requires audible sounding out and blending, later decoding is fast and silent. To analogize, we recall a word with the same spelling pattern and make the unfamiliar word rhyme with the remembered word. The pronounceable word parts strategy requires a large store of sight chunks, such as ing, ight, and tion, that readers can string together to identify words. Contextual guessing is using the rest of the sentence to guess unrecognized words. Because guesswork is slow, effortful, and not very reliable, readers rapidly abandon it as they gain decoding skill and sight vocabulary. The problem in reading words is to access the lexicon, i.e., the store of words and associated information in memory. Before we ever learn to read, we store an incredible web of words with their pronunciations, meanings, syntax, and sometimes spelling data. 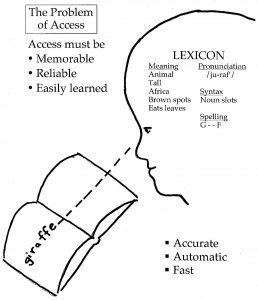 The problem in reading is to access the lexicon, i.e., to locate the entry in memory from its spelling. Access routes of skilled readers are memorable (they can call up a word easily), reliable (they get the same word every time they see its spelling), and easily learned (in just a few trials). But accurate, reliable access routes are not good enough: To save resources for comprehension, we need effortless access to words. Thus sight word access is the goal of phonics instruction. Children don’t just jump into decoding and acquiring sight vocabulary. They move through predictable phases of using the alphabet more and more skillfully. Before children learn to use the alphabet, they employ a default strategy of attaching a visual cue to meaning. This visual cue strategy explains why very young children can recognize many words in their normal surroundings, for example, reading McDonald’s with the arches logo. They are simply recognizing pictures. When children gain alphabetic insight, they begin to use phonetic cues instead of visual cues. They use some letters (usually at the beginning of a word) to cue some of the phonemes in the word, providing a systematic access route to the word in the lexicon (though not a reliable route). Reliable access comes in the alphabetic phase, when children learn to decode words from spelling alone. Alphabetic phase reading allows children to rapidly acquire sight vocabulary. Contrary to past beliefs, sight-word learning does not depend on rote association. Children learn sight words in just a few quality encounters. Quality encounters connect letters in a spelling to phonemes in the pronunciation, usually by sounding out and blending. In other words, we typically learn sight words through careful decoding. Though decoding demands great attention in young readers, it sets up reliable access routes to retrieve the word. Once the access route is established, the tools to build it (correspondence rules) drop out. The spelling becomes a meaningful symbol of spoken word (i.e., it “looks like” the word). Learning to decode dramatically reduces the number of trials to sight recognition from an average of 35 trials to an average of 4 trials. How do we lead children to the full alphabetic phase where they can sound out words? Phonics is designed to accomplish this goal. Phonics is simply instruction in decoding. It involves teaching correspondence rules and how to blend. Two types of phonics have been developed: explicit and analytic. Analytic phonics is designed to avoid pronouncing phonemes in isolation. This necessitates roundabout explanations, and it presumes phoneme awareness rather than modeling how phonemes are cued and assembled in decoding. In explicit phonics, teachers pronounce phonemes in isolation to model how to sound out and blend. Studies show that explicit phonics is more effective in leading children to early reading independence. One other factor has been shown to be important in phonics: decodable texts. Decodable texts are simply texts in which most of the words can be decoded using correspondences children have learned to date in their phonics program. While such control temporarily restricts the literature value of practice texts, research shows that it induces a decoding strategy in beginning readers. Because the phonics they learn works to unlock the words in their stories, they rely on a decoding strategy in reading. This helps them gain sight words rapidly, and also helps them figure out patterns not explicitly taught in phonics lessons. As they expand their sight vocabularies and decoding power, controls on decodability can rapidly be removed, allowing them to read and enjoy children’s literature. The problem with alphabetic-phase reading is that it is slow and effortful. Fortunately, as children learn sight words and sight chunks, they learn shortcuts to word recognition. They remember chunks of spellings for quick assembly. These chunks are pronounceable word parts that can be recognized without analysis. Using chunks allows readers to decode polysyllabic words by stringing together the familiar parts. The key to expert decoding seems to be learning vowel correspondences–the heart of every syllable. Also, it takes lots of reading practice to acquire sight words and sight chunks. Children must be led to read voluntarily as a leisure time activity to take on this level of practice. Should our goal for beginning readers be to remember words by sight or decode? The answer is both. To progress toward reading expertise, children must learn to decode and to read words by sight. However, sight word reading depends on decoding–knowledge of our alphabetic system. Thus, learning to decode must come first.